As we are all still grieving the horrific shootings in Orlando, this article points out the hospitals and medical teams who took care of the victims. As staff called co-workers at home and asked them to come in and help with the overwhelming number of patients coming in to the emergency room, the response was “I’ll be right there”. We know our Nurses across the country would respond the same way. Things started out fairly well, by a busy emergency room’s standards. The Orlando Regional Medical Center had been warned that gunshot victims would be arriving from a nearby gay nightclub, and the first one was conscious, talking and medically stable. But then another victim from the mass shooting early Sunday at the Pulse nightclub arrived, and another, and another, in critical condition with devastating injuries. Four or five of the earliest patients died. And then victims kept coming – not always arriving in ambulances, but sometimes in the backs of trucks, sometimes seemingly just appearing in the halls of the hospital, awaiting treatment. Gunshot victims aren’t an unusual sight at the 75-bed facility in downtown Orlando, nor are they for any trauma center handling the daily chaos of a major American city. 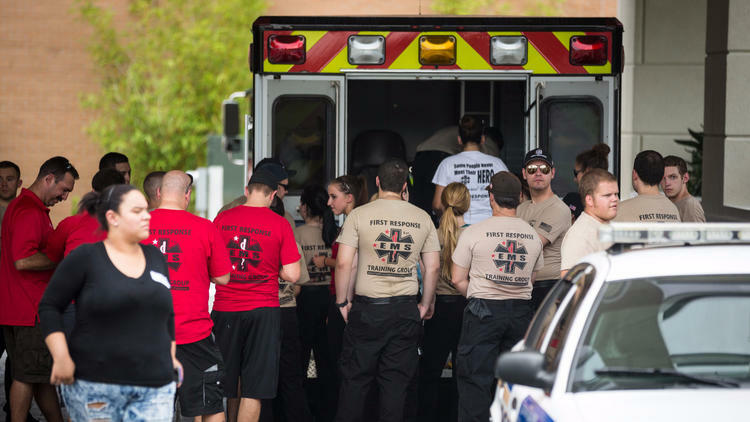 ut on Tuesday, staff at the hospital described what it was like to confront the aftermath of the deadliest mass shooting in modern American history, with one staffer likening it to a “war scene.” Forty-nine victims were killed. Nine of those victims died “in the first few minutes” after arriving at the Orlando Regional Medical Center, which received 44 victims from the shooting, according to Dr. Michael Cheatham, the hospital’s chief surgeon. Six of the 27 victims still being treated at the hospital Tuesday were in critical condition, and doctors warned that some may die. Twelve victims were also treated at Florida Hospital in Orlando, where six remained in fair condition. The victims arrived at Orlando Regional Medical Center in two waves over the course of Sunday morning. There was an initial batch of almost two dozen who arrived shortly after shooting began at 2 a.m. A second group arrived after police confronted and killed the gunman. Some of the wounds were small, looking like they were from the shooter’s handgun; others were much larger, probably from the shooter’s .223-caliber semiautomatic rifle, according to Joseph Ibrahim, the center’s trauma director. Some victims looked like they’d been shot from close range. Some looked like they’d been shot while running away. One victim had 11 gunshot wounds; another had four surgeries after arriving Sunday, doctors said. Many of those who died suffered head wounds, they said. One of the victims taken to the hospital was clubgoer Angel Colon, who was shot three times in the left leg as he ran away from the gunman, and then was trampled by other club patrons trying to escape. “I can just see him shooting at everyone, I can hear the [shots getting] closer, and I look over and he shoots the girl next to me,” Colon said. “I’m next – I’m dead,” he recalled thinking as the gunman approached. The gunman shot him in the hip and hand and moved on as Colon tried to show no reaction. Soon the police arrived, and Colon said he could hear officers trading gunfire with the assailant. Colon saw an officer, and the officer grabbed his hand, saying, “This is the only way I can take you out.” He then dragged Colon out – as broken glass cut Colon’s back and his legs. “I don’t feel pain, but I just feel all this blood on me, from myself, from my other people,” Colon said. 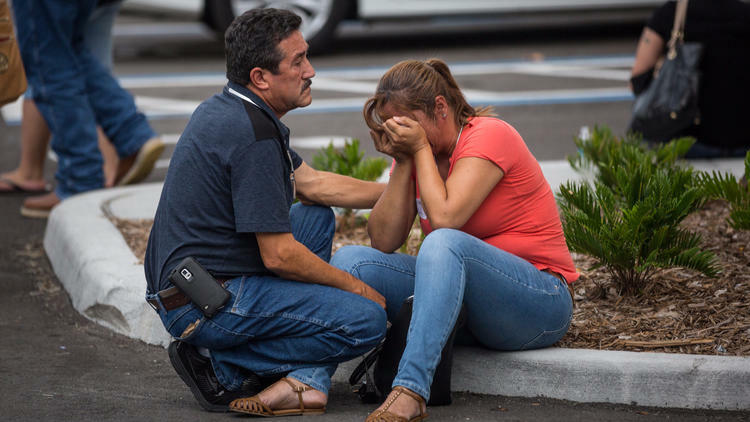 “He just drops me off across the street” – outside a Wendy’s restaurant -- “and I look over, and there’s just bodies everywhere, we’re all in pain.” There, an ambulance took Colon to the safety, and the chaos, of the Orlando Regional Medical Center. As more patients arrived, the on-duty staff began calling more doctors, and more nurses and other staffers, who answered their phones in the middle of the night with a common answer: “I’ll be right there,” according to surgical intensive-care unit director Chadwick Smith. An army of nurses arrived – dozens who were supposed to be off-duty – along with X-ray and blood technicians as doctors set up a triage to treat the most gravely injured patients, said Bondani. Workers speedily cleaned up operating rooms after the end of one surgery so doctors could immediately begin another. Coordinators responded immediately whenever supplies ran low. The scene was emotional, with “people in pain, people worrying about their loved ones, people not knowing where their loved ones are,” said Smith. But doctors said that despite the chaos, the hospital’s emergency plan worked smoothly and efficiently. Aside from the initial patients who died immediately after the shooting, no one else at the hospital had died in the 48 hours since the attack, doctors said. Smith got emotional at Tuesday’s news conference as he talked about watching hospital staffers arrive in tears to do their jobs.